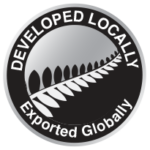 Wash applications rely on the impact of the spray to help dislodge residue. The full cone spray pattern nozzles distribute the kinetic energy of the fluid being sprayed over a large area and this reduces impact. So in order to achieve the required impact other spray patterns are required. Typically a flat fan spray pattern will be used. The problem is that this only cleans a thin line, so some kind of relative motion will be needed to clean a target area. This motion can be provided by a conveyor moving product under a cleaning spray bar or by a moving spray bar. The deflection type nozzle produces the flat fan pattern by deflecting the fluid stream against a curved surface after exit from the nozzle orifice. The impact of the fluid on the deflection surface cause the desired atomisation and the geometry of the surface shapes the resulting spray into a flat fan pattern. 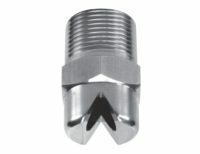 With this design of nozzle the spray pattern is formed by the exit of the fluid through a shaped orifice. This spray will be a high impact flat fan. These nozzle have a lower profile than their deflector design cousins and so may be more appropriate where space is confined. 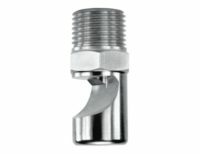 BETE provides a wide variety of nozzles which are useful for a range of street cleaning and water truck applications. Our engineers have decades of experience in designing custom nozzles solutions that are reliable in the most demanding scenarios. Street Cleaning: BETE’s high pressure, flat fan nozzles are ideal for pushing sand, dirt, and other debris off of roads and paved surfaces. 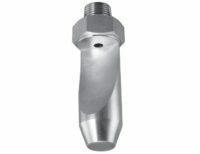 Our nozzles are designed to withstand high pressure operating conditions. Dirt Road Dust Prevention: BETE’s fan nozzles spray water evenly over a large area – useful for applying water along dirt roads, construction sites, and fairgrounds to prevent large dust clouds created by vehicle or animal travel. Brush Fire Vehicles: Brush fire vehicles must spray water near their truck to extinguish fires as they work in remote places. BETE’s line of fan nozzles are a reliable and durable solution for installation on these vehicles.